BUILT TO LAST: The high bar is made from heavy-duty MDF boards and steel hardware, and is designed to hold the weight of whatever you store on it, while resisting stains, scratches and fading from UV rays. 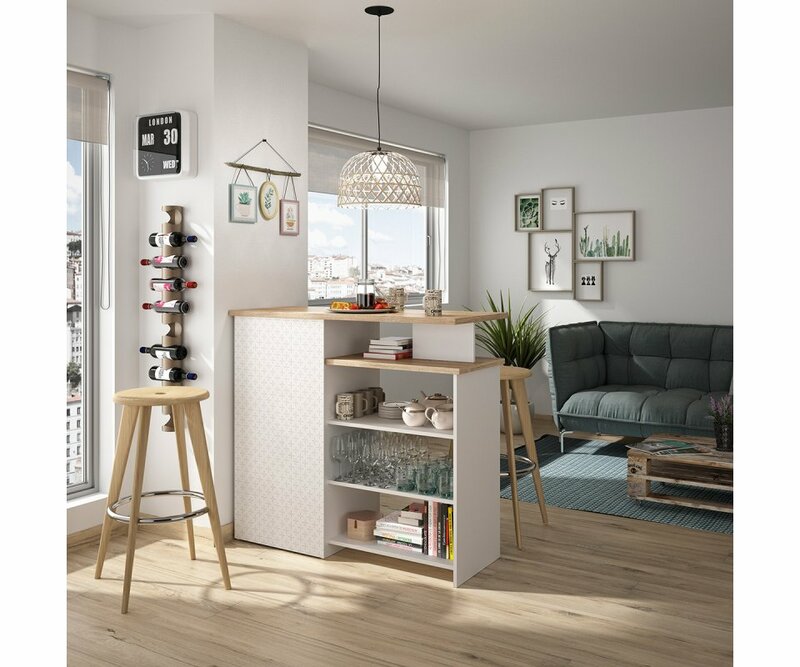 ATTRACTIVE STORAGE: The Plus High Bar features open shelves and closed cabinets, along with staggered counters to store and display bar items, home décor, and more! CREATES A ROOM DIVIDER: The Plus High Bar is so attractive for storage, display and counter space that it can be used to divide a dining room from a kitchen or living room space! RoomSmart’s Plus High Bar is a multi-purpose unit that will have you wondering how you lived without it! 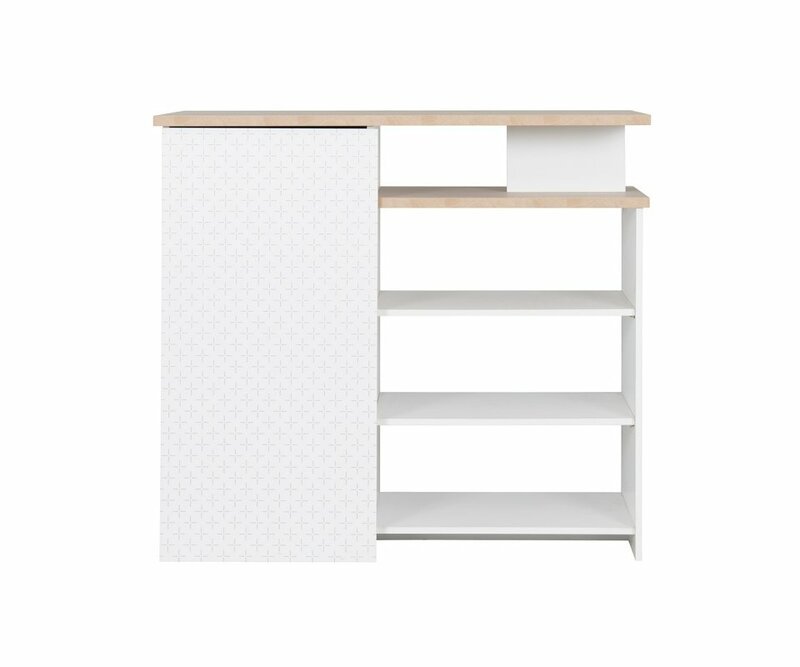 The bar is designed with sleek Scandinavian style, featuring natural woodgrain countertops, solid clean white cabinetry and a visually appealing white, plus-sign patterned veneer on the cabinet door. 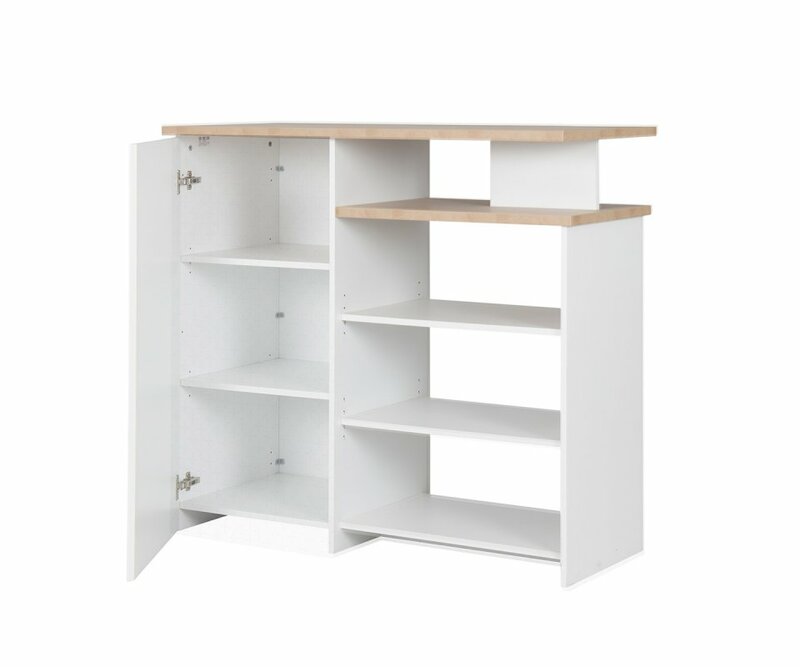 The bar is designed tough for today’s busy families, and is made from top-grade MDF boards and strong steel hardware, so shelves won’t bow or split under weight. It is finished in premium durable veneers that resist scratches, stains, water ring damage and fading or yellowing from UV ray exposure. Roomy countertops, closed cabinets and open shelves provide a place for everything you need in a bar or entertainment area. You can even use it as a room divider, between dining or entertainment area and a kitchen or living room. At just under 4’ long, that’s a great feature even in downsized spaces like a studio apartment or condo. You are going to love the clean lines and details, and the practical features of the Plus High Bar! CONTEMPORARY DESIGN: Sophisticated modern Scandinavian design features tapered legs and sleek lines, creating a unit that will coordinate with most décor styles and color palettesSTRONG CONSTRUCTION: The Chloe sideboard is made from top-grade particleboard and joined with heavy-duty steel hardware, ..
INDUSTRIAL STYLE: The Russel desk is perfect for teenagers and adults, with cutout panels and streamlined design, and will look stunning in bedroom, living room or office spaceTWO-TONE COLOR: Natural warm woodgrain combined with sleek Black adds elegance and coordinates with many décor styles and co.. STREAMLINED STYLE: Straight rectangular lines with flared, tapered legs adds Scandinavian simplicity and charm to this 3 drawer chest, designed to fit in any size bedroom, bathroom, or hallwayTWO-TONE COLOR: Light natural woodgrain and solid white, with a drawer in white plus sign pattern, add a cri..
MODERN ECLECTIC STYLE: The Scandinavian design, neutral color palette, tapered legs and tall narrow dimensions of the Plus 4 chest make it the perfect accent dresser for many home interior stylesSTRONG & STURDY: The Plus 4 drawer chest is made from premium MDF boards, and is joined together with..
ECLECTIC STYLE: Streamlined Scandinavian design features neutral coloring, natural wood accents, and compact size, and will coordinate with most décor styles and color palettesNEUTRAL COLOR PALETTE: A combination of white and natural woodgrain accents gives a crisp, clean look to any room, with a de..
ECLECTIC CONTEMPORARY UNIT: This bookcase features Scandinavian block pattern design accenting woodgrain cabinetry, and will coordinate with many home décor styles and color schemesVERSATILE CONFIGURATION: Adjustable configuration allows you to have both sections of bookcase aligned on a wall, or th.. 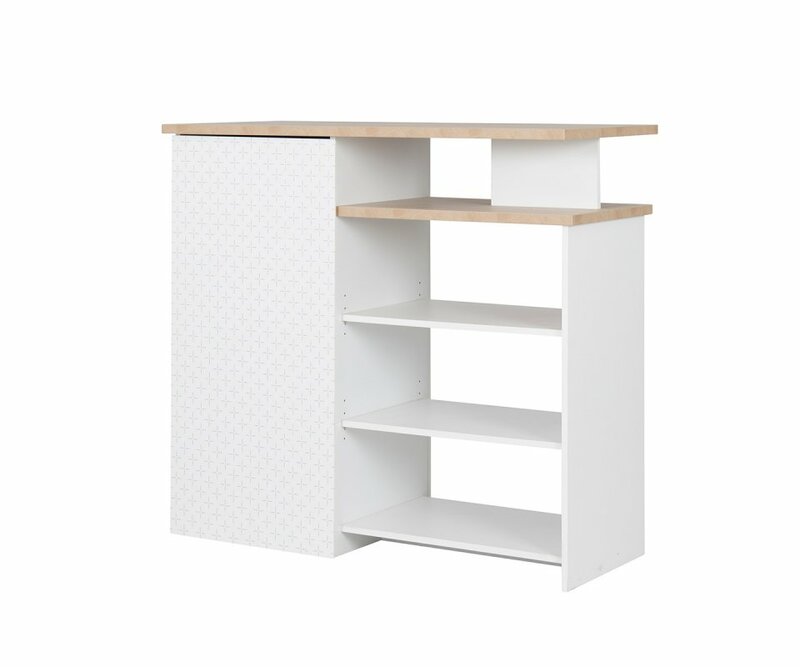 CONTEMPORARY LADDER STYLE: The modern Scandinavian design has a ladder style for visually artistic display of your favorite things for home or officeSTRONG & STURDY: The Queens bookcase is made to hold the weight of your books and collectibles without sagging or splitting. Heavy-duty MDF boards ..
SLEEK INDUSTRIAL STYLE: Black on black unit with arched accents, tapered legs, and metal hang rail add industrial style to a front entrance, hallway, or mudroom area in office or homeTWO-TONE COLOR: The Store unit is designed in gleaming black with natural woodgrain shelves, adding a sophisticated s..
ON-TREND INDUSTRIAL LOOK: Cutout side panels with shelves that extend beyond the cabinetry give a rugged industrial style to the Russel bookcaseBUILT TOUGH: The bookcase is made from top quality MDF boards and heavy-duty steel hardware, so it will remain sturdy with normal use, and shelves won’t sag..
SCANDINAVIAN LADDER DESIGN: The contemporary ladder design adds interest to your wall and lots of space for storage and displaying your favorite things for home or officeBUILT TO LAST: The Queens bookcase is built sturdy and strong to hold the weight of your books and collectibles without sagging or..
INDUSTRIAL DISPLAY CABINET: The Russel display unit provides open shelves and closed cabinet with glass door to highlight your collectibles, glassware, photos and more!TWO-TONE STYLE: Ebony Black solid cabinetry is accented with warm Oak woodgrain shelving and side panels, creating a rugged industri.. BOLD VINTAGE STYLE: Bright colors and vintage cabinetry create a bold impact for dining room, entertainment area, or officeDURABLE CONSTRUCTION: Built tough from heavy-duty MDF boards and steel hardware, the Kristian sideboard will remain sturdy and strong for years, with shelves that bear up to the.. 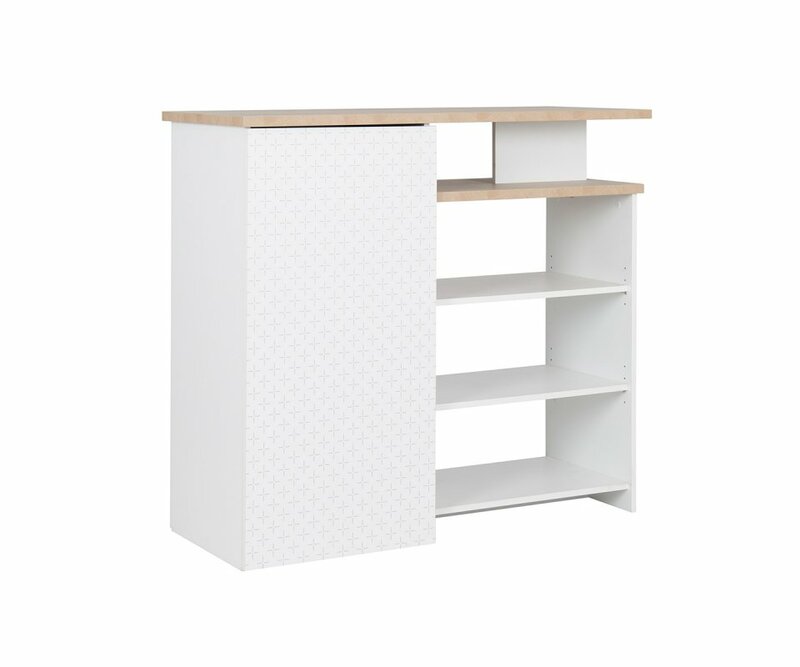 UNIQUE DESIGN: Slanted frame widens at the bottom, with a fold down desk in 3-tone color palette on the front, and makes this Scandinavian style writing desk a focal point for bedroom or living areaSTURDY CONSTRUCTION: The desk is made of heavy-duty MDF boards and steel hardware, and is finished in ..
VINTAGE STYLE: Retro style console table features a drawer and open shelf, and attaches to the wall with 2 front wire leg supports. This table adds a charming vintage accent to any room in home or office3-COLOR PALETTE: The Glena table has a warm woodgrain top and sides, with a solid gray and white ..
VINTAGE CHARM: The Mandy bookcase features multi-colored sections, black wire legs and black door handles, all combined with a light neutral woodgrain reminiscent of mid-20th century designsBUILT TO LAST: Built from top-grade MDF boards and joined with heavy-duty steel hardware, the Mandy bookcase i..
WHIMSICAL VINTAGE STYLE: Tapered legs, angled drawers and tri-color bold design make this 3 drawer chest a charming accent to any roomTRI-COLOR DRAWERS: The center drawer matches the cabinetry in charcoal gray, with a bottom drawer in bright sunset yellow, and a top drawer in white with a delicate p.. CONTEMPORARY SCANDINAVIAN DESIGN: Flared legs with unique cut design, light woodgrain finish and streamlined appearance make this Scandinavian desk the ideal choice for modern home interiorsGRAY WOODGRAIN VENEER: A silver-gray woodgrain adds a soft neutral element that will blend with almost any col..
SLEEK BLACK INDUSTRIAL STYLE: Solid black matte veneer, contrasting shelves, industrial metal accents, and glass door join together to create an on-trend industrial style display cabinetCONTRASTING WOODGRAIN TOP & SHELVES: Neutral woodgrain veneer shelves and cabinet top add a warm, rugged look ..